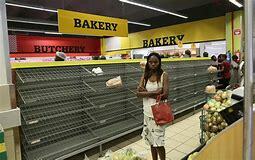 (Reuters) - Zimbabwe could run out of bread in a week after flour stocks dwindled due to the country’s failure to pay for imported wheat, according to a confidential letter written to bakers by the country’s grain millers’ group on Monday. The Grain Millers Association (GMAZ) general manager Lynette Veremu wrote to the National Bakers Association of Zimbabwe (NBAZ) to tell them the country not pay for 55,000 tonnes of wheat in bonded warehouses in Mozambique and Harare. “We regret to advise that the current stocks for foreign wheat for bread flour have depleted to 5,800 tonnes and ... we are left with less than eight days of national bread flour supplies,” the letter said. GMAZ spokesman Garikai Chaunza confirmed the letter, saying “this is the situation we are faced with”. The central bank lists wheat among priority imports like fuel and drugs, but has struggled to pay suppliers in the past. GMAZ said in December it owed foreign suppliers $80 million for past wheat imports.